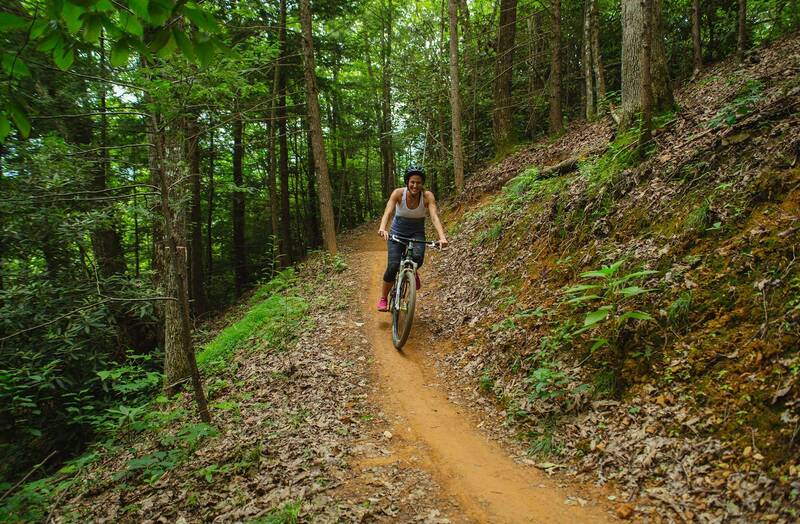 Ever wanted to try mountain biking, but were a little too nervous to give it a shot? Like a lot of outdoor sports, mountain biking can be difficult to try. CLIMB Works has solved the common concerns – Where do I go? What if I don’t have a bike? Isn’t this for experts only? Don’t you have to be in really good shape? With our brand NEW Mountain E-bikes and our guided, instructional first loop, you’ll have everything you need to conquer a new adventure. We offer several trail options in our e-bike park. Our original loop is an intermediate two-mile trail with the first 1/3 uphill, second 1/3 smooth flow trail, and last 1/3 downhill. The loop can be as easy or as technical as you want to make it. 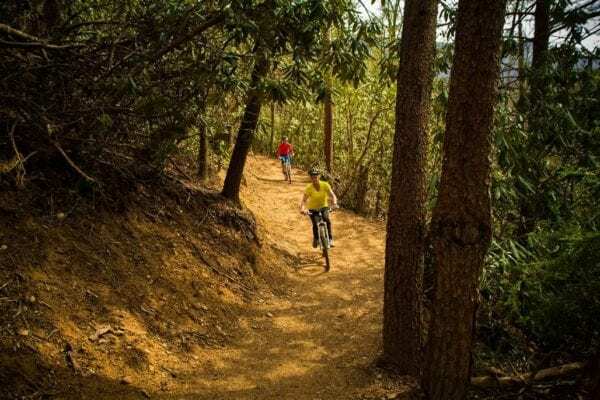 Our BRAND NEW trail for 2019 is our two-mile “stacked loop” trail that features an intermediate climbing section leading to a fast, fun downhill ride cutting through dense pines and crossing several wooden bridges. Our goal here at CLIMB Works is to push you a little out of your comfort zone at your own pace. Because of the mountain terrain, our trail is considered an intermediate trail and can be intimidating for first-timers. Luckily here at CLIMB Works, we make it easy to get started. Our professional guides provide a guided, instructional first loop that will teach proper biking techniques, educate you about trail, and be able to provide personalized instruction. 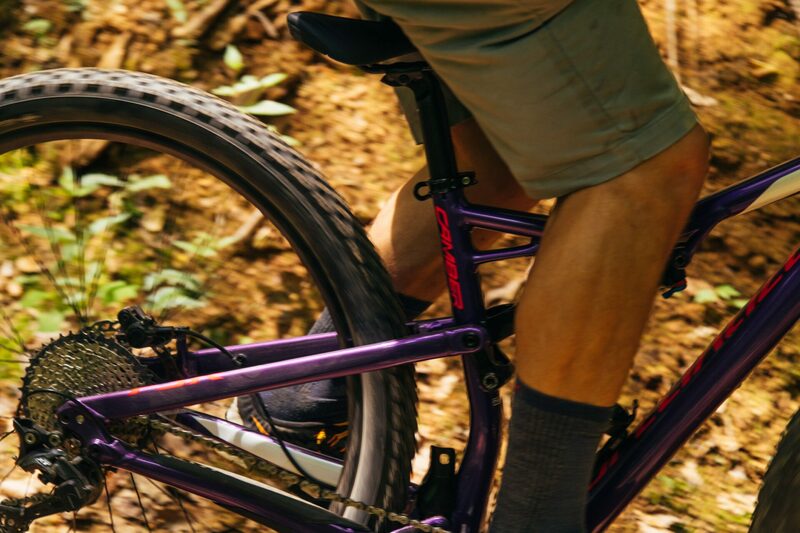 Our NEW specialized, pedal-assist E-Bikes (Turbo Levo Series) also give you the added energy to tackle the uphill portions of our trail, letting you ride longer and at your own pace. 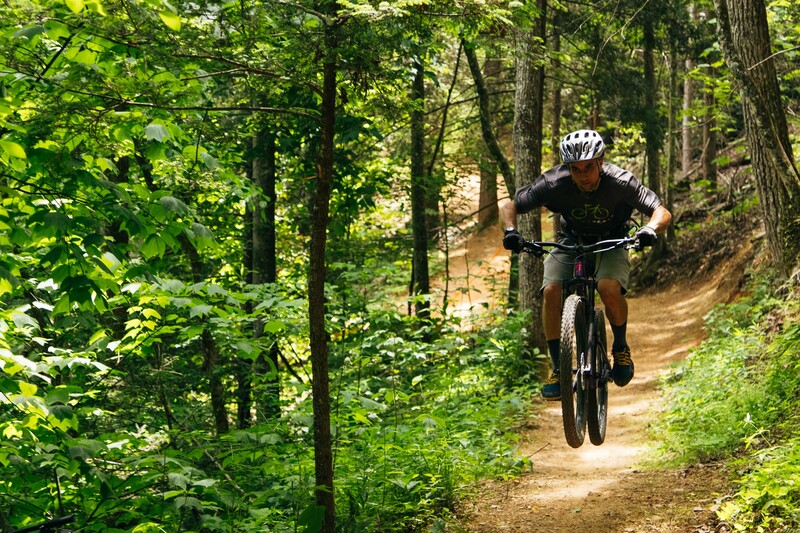 If you feel comfortable riding a bike, have decent coordination, and are ready to sweat, then you have what it takes to mountain e-bike with us. 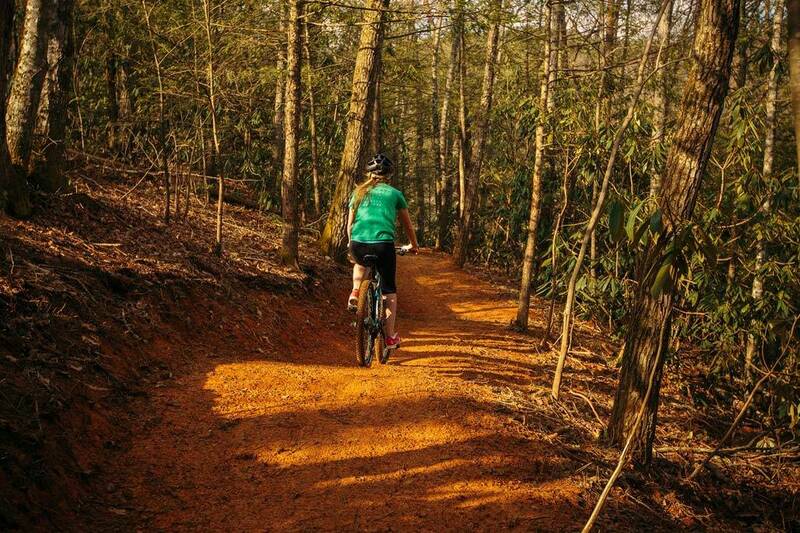 Our trails are all a one-way loop, so you’ll never have to worry about oncoming traffic. You can relax, go at your own pace, and have a lot of fun. If you’re an experienced rider, don’t think that since we love introducing beginners to mountain biking that this trail isn’t for you. 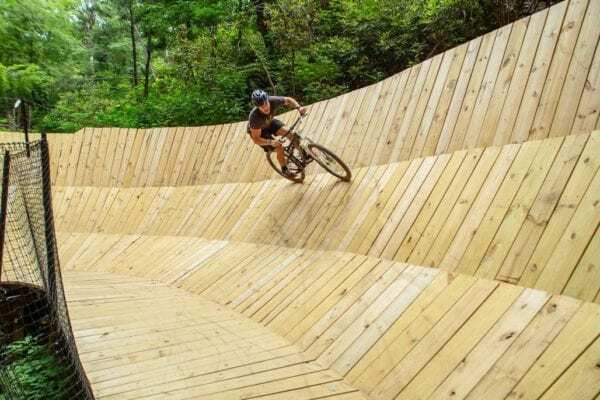 Our world-class designed flow trail is packed with technical options – rollers, berms, logs rides, bridges, and incredible wood features that will give you the exciting single track you are looking for. Add a high-end Specialized Mountain E-bike to the mix and get ready for a brand new adventure. Absolutely! 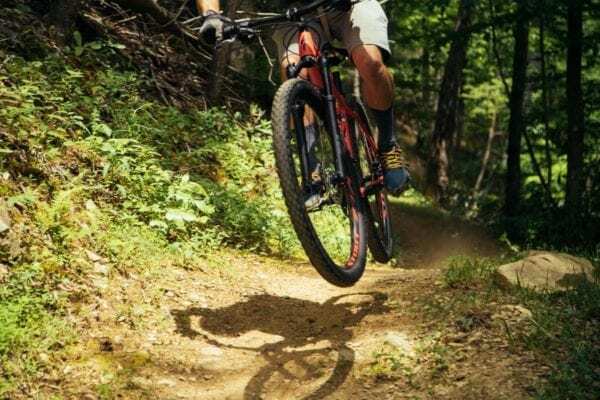 CLIMB Works offers high-end Specialized, pedal assist mountain e-bikes (Turbo Levo Series) that provide increased stability and control all while requiring less effort from you. Our mountain e-bikes allow you to take your own strength and ability to the next level. You will be able to ride longer and further than ever before! Youth bikes are available for children and teenagers ages eleven and above. Because all our rentals are inspected before and after being ridden, we guarantee you a bike in great condition. Also, we’ve simplified our gear controls so newcomer and experts alike can shift gears easily making the experience more enjoyable. You certainly can! Road, hybrid or “townie” bikes are strongly discouraged as they do not provide adequate traction and control the trail necessitates. OUR FLAGSHIP FEATUREThis wooden, roller-coaster-esque structure fittingly named “The Curliest” is the pride and joy of El Regis Trail. Tucked in the heart of the Smokies, built over a stream, and designed to be pleasing unto the eyes as well as the wheels, The Curliest can be ridden as many times as you’d like. CAN ANYONE DO IT?The answer to that is yes. While experts can push themselves higher and higher, beginners can take it as slow as they’d like. If you feel comfortable riding a bike on a sidewalk, you can feel comfortable riding on The Curliest.